I love the version which my mom makes. Sometimes we add brinjals also. Wash and chop the spinach leaves. Heat oil in a kadhai and temper mustard seeds. Add chopped onions and saute a while. Add ginger-garlic paste and chopped tomatoes. Mash the tomatoes and add turmeric powder, red chili powder and cumin powder. Mix well and add finely chopped spinach leaves. Add 1/2 cup water and salt to taste. Cook it covered for 10 mins. 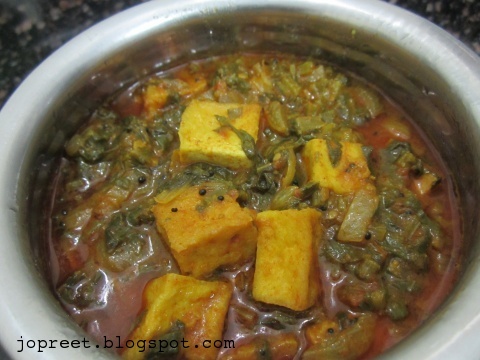 Add paneer cubes and cook for 10 mins. Cook till the water level reduces to half. Serve hot with chapati or roti. Palak paneer looks delicious. addition of brinjal sounds good idea. Nice. The palak is not made into a puree. Great variation. What a yummy curry.. 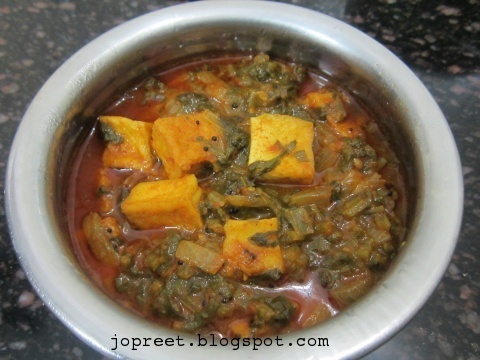 I prefer palak like this in the curry and not pureed.